Research increasingly links low literacy levels in the early grades with a range of poor outcomes; for instance, students who read below grade level at the end of third grade are about four times less likely than their higher-achieving peers to graduate from high school (Annie E. Casey Foundation, 2010, 2011; Balfanz, Bridgeland, Bruce & Fox, 2012). In a four-year study, researchers from the Consortium for Policy Research in Education (CPRE) at the University of Pennsylvania and the Center for Research on Education and Social Policy (CRESP) at the University of Delaware examined the effectiveness of Reading Recovery—a widely used 1st grade literacy program—at helping struggling early readers catch up. The study’s findings offer promise for intensive early literacy intervention. Abigail Gray; Henry May; and Philip Sirinides (2017). 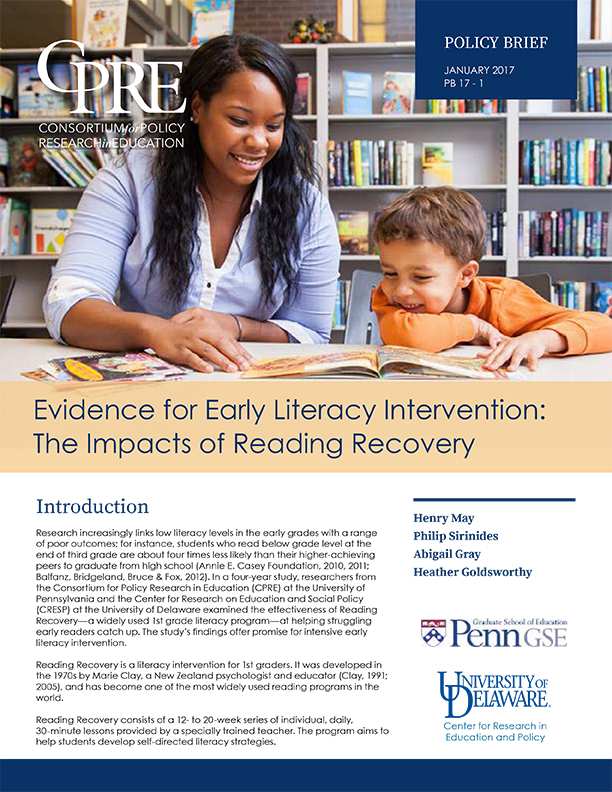 Evidence for Early Literacy Intervention: The Impacts of Reading Recovery . CPRE Policy Briefs.